An elderly woman, Keiko Fukuda, sits in the only chair allowed on the light green carpet of padded mats in the judo club. It’s just a metal folding chair, but her students treat her like a queen on a throne. They hang on every soft-spoken word, every wave of a hand, every approving nod or smile. She is dressed in brilliant white: a quilted jacket with overlapping lapels over thin white pants with reinforced knees. It is her cherry-red belt, knotted loosely over her jacket, that marks her as sovereign. The belt signifies that Keiko Fukuda, who celebrated her 90th birthday last spring, is the highest-ranking woman in the world in judo, a Japanese martial art in which technique and balance — rather than power — are the key to victory. During a recent class in her San Francisco club, Keiko Fukuda watched a 22-year- old woman struggling to learn a new move — a “side sacrifice” technique, in which the attacker drops to the ground while grasping the lapels of an opponent’s uniform, rolls to one side and tosses the opponent into a heels- over-head somersault to the mat. In judo, an individual uses an opponent’s strength, weight and momentum against the opponent. When words and gestures failed to get an important point across, Fukuda rose slowly to her feet. She left her sturdy black cane, with its wide curving crook, resting on the mat. In tiny, staggered steps, Fukuda moved into position in front of the student. She reached up to grab the young woman’s lapels, grasping them with wrinkled hands stiff from arthritis and weakened from old judo injuries. The room fell silent. Everyone else stopped training and turned to watch. Fukuda dropped, rolled and threw her young opponent — three times in a row. She then returned to her chair for the rest of the two-hour class. 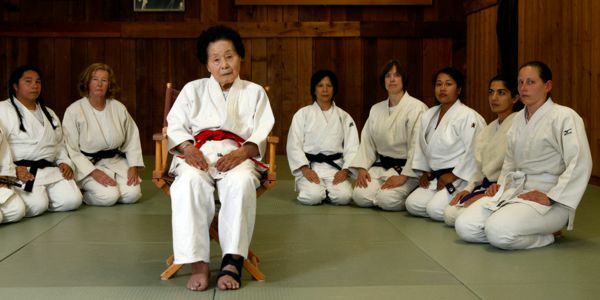 Keiko Fukuda, who stands a couple inches shy of 5 feet, has been teaching judo for nearly 70 years. Fukuda, who surrendered her Japanese citizenship to become a U.S. citizen, has traveled all over her adopted country spreading the gospel of judo. She also has given seminars in Australia, Canada, New Zealand, Norway and the Philippines. When she was 76, she flew to France to teach the country’s top-ranked judo instructors. The U.S. Judo Federation, which represents more than 350 clubs, gave Fukuda the red belt in Keiko Fukuda2001, in recognition of her lifelong contributions — domestic and international — to the martial art. The U.S. federation has awarded only three red belts. The two other recipients were men, who have since died. The belt indicates Fukuda has reached the ninth level in judo. 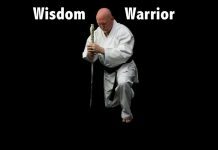 In the history of the 120-year-old martial art, only about a dozen people in the world have achieved a higher rank — the 10th level. She continues teaching today despite the ailments of old age — Parkinson’s Disease, which makes her right hand tremble like a leaf in a breeze, triple bypass surgery more than a decade ago, and aged ankles and knees. 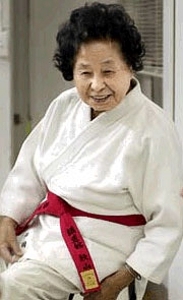 Keiko Fukuda is revered as one of the last living disciples of Jigoro Kano, the founder of judo. Kano, who opened his judo school — known as the Kodokan — in Tokyo in 1882, added a “Women’s Section” about 40 years later. 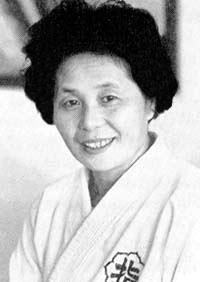 When Fukuda began taking lessons in 1935, she was one of only two dozen women in the school, which is known today as the Kodokan International Judo Center. Kano had invited her to study judo because of her martial art lineage. She was the granddaughter of a renowned jujitsu master, who had taught that Japanese martial art to Kano. “At that time, I was only 21 years old, being taught the ways of Flower Arranging, Formal Tea Ceremony and Brush Writing, which was customary for young ladies in Japanese society,” Fukuda wrote in her 1973 book, “Born for the Mat: A Kodokan Kata Textbook for Women.” “Through memories of my grandfather I felt very close to judo, even though I had never seen judo practiced before.” Fukuda’s mother — her father died when Fukuda was very young — accompanied her to the judo school that day. “I decided to take Judo lessons a few months later,” Fukuda wrote. “My mother and brother both supported me, although my uncle opposed the idea because I was a woman. My mother’s and my brother’s thoughts were for me to learn, and get married to a Judoka (a judo expert) someday, but not to become a Judoka myself.” She would never marry. “Judo is my lifetime partner,” Keiko Fukuda said, speaking through a translator during a recent interview in her Noe Valley home. “Any place I go, judo is my family. Students are very nice to me. I have family all over the world.” Fukuda first visited the United States at the invitation of a judo club in Oakland in 1953. She stayed for 11/2 years. She returned to California in 1966 and traveled all over the state giving seminars. That same year, she gave a judo demonstration at Mills College, and the school immediately offered her a job. She taught judo there for more than a decade. During those same years, Keiko Fukuda also taught in the home she shared with Fernandez on Hoffman Street. When the number of students swelled, she moved her classes to a Buddhist temple in Japantown. Her club, the Soko Joshi Judo Club (“The Women’s Judo Club”), moved to its current quarters, at Castro and 26th streets, in 1973. Fukuda still teaches there three days a week, offering classes for female students aged 13 and older. Her students have hailed from all over the Bay Area, including San Rafael, Berkeley, San Jose, San Francisco and Santa Cruz. The wall above the wooden desk in the club is crowded with more than a dozen plaques from grateful students. Most begin with the words “In Appreciation.” Many more awards are stashed in her home just a few blocks away. She has given her “Order of the Sacred Treasure, Gold Rays with Rosette, ” a silver-and-gold medal studded with dots of ruby-red ceramic, to her brother’s family in Japan. The award is one of the country’s most prestigious honors for people aged 70 and older. The Consul General of Japan gave Fukuda the medal, along with a signed certificate from the Prime Minister of Japan, at a gala dinner in San Francisco in 1990. Last week, Keiko Fukuda took home another award — an engraved silver bowl from Tiffany. She was one of four women over age 70 who received 2003 Women of Achievement, Vision and Excellence awards from GirlSource, a nonprofit group for low-income teenagers in San Francisco. “Too many awards, too many awards,” Fukuda quietly insists when reminded she will soon receive another — from the U.S. Judo Federation — to add to her collection. Fukuda’s judo motto is: “Be strong, be gentle, be beautiful.” For those unfamiliar with judo, it may be hard to reconcile the words “gentle” and “beautiful” with a sport in which competitors send opponents sailing through the air and slamming to the ground. Keiko Fukuda is renowned for her expertise in judo “kata,” a choreographed, mock fight between two people that demonstrates, in various combinations, the martial art’s offensive and defensive moves. 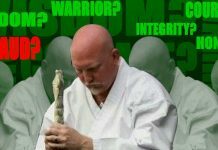 “Through the study of Kata, one will experience the true spirit of actual fighting, and comprehend the principles of technique,” she wrote in “Born for the Mat,” which includes step-by-step instructions, in words and photographs, of the seven katas of judo. The book’s cover photograph shows Keiko Fukuda performing a particularly difficult move, in which she is balanced on a partner’s arched back. Fukuda’s body tilts at a 45-degree angle to the floor, her head facing the mat, her toes pointing toward the ceiling — a move she had to hold for several seconds. A black-and-white photograph hanging in Fukuda’s home shows her — at 51 — in that same gravity-defying pose, during a kata demonstration at the 1964 Summer Olympics in Tokyo. It was the first year in which men earned Olympic medals in freestyle judo, matches in which competitors won points for throws and immobilizing holds. Women’s freestyle matches were added at the 1992 Olympics in Barcelona. But there is no kata competition at the international event — a situation Fukuda would like to change. Fifteen years ago, she established her own tournament, the Fukuda Judo Kata Championships. This year, the tournament will be held on Oct. 25 at the San Jose Buddhist Judo Club. It is expected to attract about 100 participants, including competitors from other countries. Fukuda has also worked for many years to spread kata competitions throughout the world, said Robert Fukuda (no relation), executive director of the U.S. Judo Federation, which represents nearly 10,500 members. While Fukuda’s sights are set on that Herculean goal, she has no problem focusing her still-keen eyes on the parade of students who still seek her advice and appraisal. 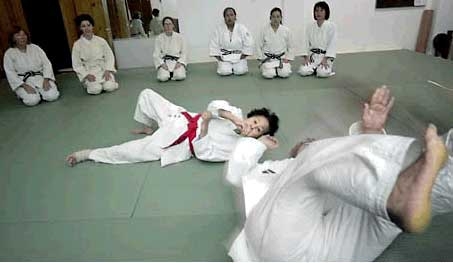 When she attends judo seminars these days, Fukuda usually watches students from the protective comfort of a wheelchair. But she doesn’t hesitate to rise out of the chair onto the mat when she sees they need help. Kathleen Sullivan was a Staff Writer for the San Francisco Chronicle.